FULTON, NY – Ermida “Anita” Rose Cardinali Procopio, 95, lifelong resident of Fulton, passed away peacefully on Sunday, March 19, 2017, at St. Joseph’s Hospital in Syracuse. A graduate of Fulton High School, Ermida worked as a nurse’s aide at A.L. Lee Memorial Hospital until the mid-1960s. 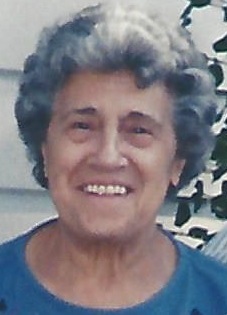 Mrs. Procopio was a lifelong communicant of Holy Trinity Church in Fulton and was a member of the Catholic Daughters. She was a sports enthusiast in her younger years and played basketball, field hockey and bowling. Ermida was a loving and dedicated caregiver to all of those who surrounded her and came into her life. She also enjoyed cooking, baking and feeding those she loved. She was predeceased by her parents, Sisto Cardinali and Richetta “Rita” Cafolla Cardinali; son, John Michael Procopio; daughter-in-law, Sharon Scott Procopio; three sisters, Anna Cardinali, Flora Callen and Augusta “Gussie” Sereno. Surviving are her husband of 69 years, John Procopio of Fulton; two daughters, Linda (Ram) Iyer of Olathe, Kans., and Christine (Thomas) Marvell-Harrington of Merrimack, NH; sister, Sarah Fruce of Fulton; brother, Ralph (Barbara) Cardinali of Wampsville; four grandchildren, Michael (Meghan) Procopio of Austin, Texas, Eswar Iyer of Silver Spring, Md., Suneil Iyer of Seattle, Wash., and Allie Marvell of Merrimack, NH; a great-grandson, Vincenzo Procopio of Austin, Texas; several loving and caring nieces and nephews. A Mass of Christian Burial will be celebrated 10 a.m. Wednesday, March 22, at The Church of the Holy Trinity, corner of Rochester and South Third streets in Fulton. In lieu of flowers, donations may be made in Ermida’s memory to Catholic Charities, 365 W. First St., S., Fulton, NY 13069. What a wonderful woman. What a beautiful couple. Such a beautiful soul. My condolences to John and the Procopio family. May God bless each and everyone of you! What a great lady. I have fond memories of St. Mary’s School when her son John and I were kids. I will miss seeing her in the front pew at Mass. My thoughts and prayers are with all your family. rest of the Procopio family for sharing her with us. Our warmest wishes to you all.